Twice a year, Rockford holds ArtScene, an event intended to showcase the works of area artists. The event runs Friday and Saturday from late afternoon through the evening. One challenge is that generally 35 to 40 venues scattered around the city host artists. Another of the difficulties is that the event gets very little useful notice or promotion from the local media (sorry, but a photo in the Sunday paper or a short film clip on the Saturday late news, does not help). A few artists post invitations to their friends, but attendance is spotty. The most recent event was challenging and we knew before the event started. Weather was predicted to be rainy and cold, not conducive for folks that might attempt to visit multiple venues. Rather than risk sitting around all weekend doing nothing, I decided to use a portion of my space to place a small Still Life display, set up my French Easel and create a painting during the event. I thought that my painting demonstration might stir up interest in my art and perhaps result in an off-the-easel sale. The painting, Flowers in the Can (above) was created Friday night. It was so much fun that I tackled the larger, Flowers in a Pot (below) on Saturday night (close to finish on Saturday, but needed a few finishing touches at home). As any plein air artist knows, painting in public leaves one very vulnerable to comments. Several people did not realize that I had the display set up and wondered if I was making these paintings up out of my imagination. One person asked if I was painting in watercolors. I replied that these were oils, her response was that she felt that I should be painting in acrylics. There were additional interesting comments, but I will refrain from sharing at this time. Slow weekend. No sales, but I did walk away with two good paintings from the event. I plan to paint again at the next ArtScene this October. Hopefully to more favorable financial results. 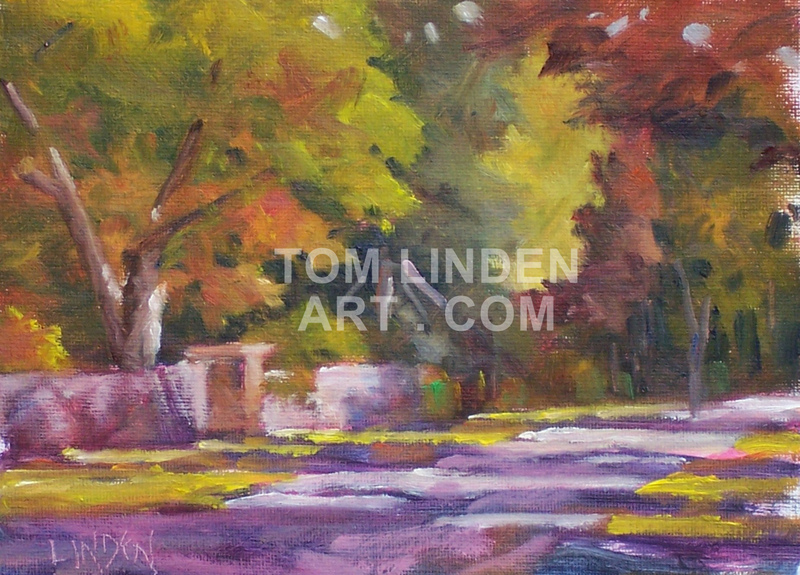 A scene from a summer plein air expedition was my inspiration. That display was a bucket suspended from and old metal headboard in a garden. The bucket contained a few very small flowers, or perhaps they were weeds. Anyway, they were small, scraggly and a bit unappealing. It was also very shaded. I decided to use this idea and instead of the metal headboard, I opted to place the bucket on an old wooden fence. I used a small plein air study to work in the flowers. Added the bright sunshine too. Plein Air - October 11 #1, Oil on Canvas Panel 6" x 8"
Plein Air - October 11 #2, Oil on Canvas Panel 6" x 8"
The Eagles Nest group decided to go back to Grand Detour for another session before the October 15 OPA Paint Out. I arrived early, a rarity, and found a spot just off of the parking lot, looking north from the John Deere homestead. Great range of colors and great light. The toughest part of the painting was to stick with the original light and shadows. 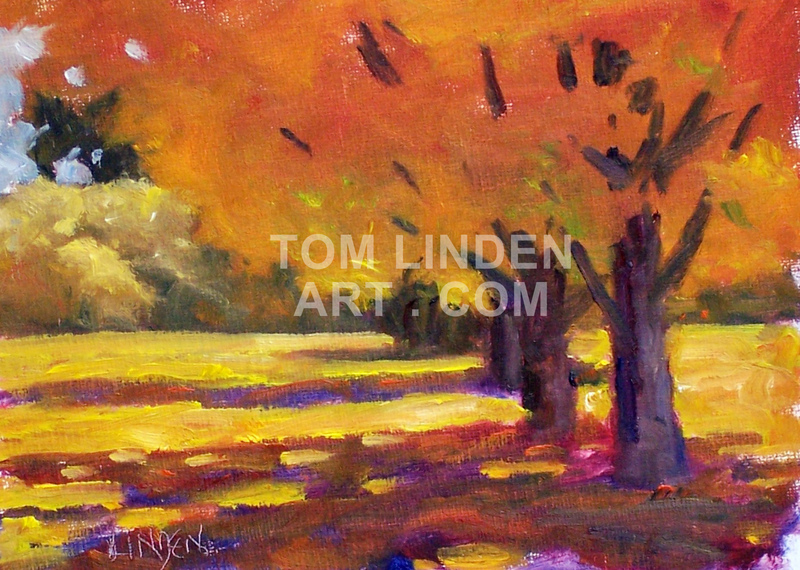 As the sunlight shifted through the scene, different trees and colors caught my eye (no, it didn’t hurt). I could have stayed at that spot and painted another version of the same design based upon different light/shadow patterns but I decided to move on. Maybe I will use this spot again at Saturday’s paint out. I walked west from the homestead. About a half a block past, I turned around and liked the view of these trees which set on the north side of the settlement. I didn’t like the looks of the design with the road, so I took it out. Same for the administration house which would invade the right side of this design. Out. In some respects a boring picture, but it was fun to paint. Loved the colors and I finished in time to join the others for lunch. So many possible scenes around this village and so little time. The colors change quickly.